I have started sailing a 420 right after finishing my RYA level 2 and found it a fantastic boat for learning essential club racing skills - I am now sailing it with spinnaker and trapeze in local club races. While it is forgiving enough and confidence inspiring for less experienced sailors, it is also a rather fast boat once you gain more experience. I am a regual 420 sailor on the national fleet and just thought i would try and inspire you to join our wonderful fleet, The boat is especially popular with youths being a ISAF Youth Class for 2009. The ideal weight range is between 12-23 stone, we fit neatly in the middle at 20.5 stone. 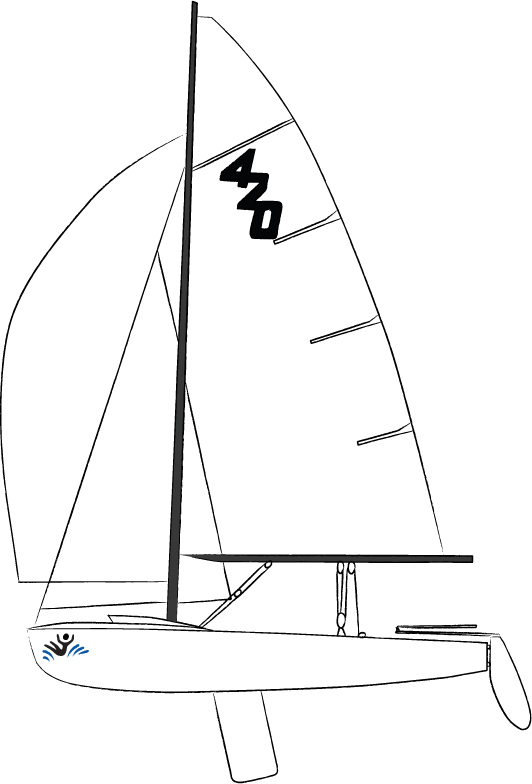 Richard H review mentions some problems with the boat however, these are quickly sorted if the boat is tuned and set up properly, for example the top batten is adjustable and in light winds we let it of a bit, and i have never heard of the mainblock fitting coming loose, so i think it may be a one off. The 420 is definitely more of a strong wind boat, whilst moving well in light winds it has pretty poor pointing due to an inefficent jib slot this is easily solved by barberhauling as the wind picks up and keeping weight well forward up the beat, the boat has a large planing surface at the back of the boat and modern builders are moving the center of balance further back to enable the boat to get on the plane more quickly, once on the plane the boat builds up apparent wind allowing you to sail higher and faster, by feathering the boat up. The result is one of the fastest upwind boats in over 20 knots of wind. The boat is very tweeky and sailors pay special attention to mast set up which is used to power up and de-power the boat, which MUST be sailed flat at all times in order to do well. In over 15 knots of wind the class is allowed to ooch and pump the rig to get the boat planing. Sailors also bring the centerboard up slightly to move the center of balance further back and to depower the rig. Downwind the boat has a symmetric spinnaker, again the helm and crew can pump the sails in over 15 knots, the boat is best sailed on broad reaches with jybes however in stronger winds big gains can be made by sailing dead down wind. Helm and crew weight should be well forward until the bow starts going down then move their weight back gradually. The most popular make in the UK is Zeiglemayer, however polish builder blueblue is making is mark on the fleet with several of the top sailors changing to this new class. Other makes include Nautivela, Lenem, and Simon Cooke. IBI sailing is the best source for 420 kit with Charles Ainsworth the owner recently nominated as the class technical consultant in England with Curra dinghy and Tom Mapplebeck in Ireland. I've sailed a 420 a couple of times, and while it's quite nice to sail, it does have a few niggles that stop me wanting to sail it more. The first time I sailed it there was barely any wind - but it still moved well. The next few times though we have a few problems, firstly with the snap batten - the top batten in the 420 sail is a full width batten and in light winds it doesn't always flip over to the new side properly when you tack or gybe, and you end up with a main sail that's backed for the top 4 feet or so. We've also got problems with our club boat including the mainblock fitting coming loose because the fibreglass is broken, which looks like a structural design fault on our boat. That said - when it gets moving, it does move nicely. Edit - as Rob F says, he's never seen the mainsheet block fitting break before - I suspect this is just related to the boat in our club, as it's a memorial boat and we are not often allowed to sail it, so as a result it is poorly maintained, and I wouldn't be surprised if the centreboard casing was a rebuild. This also explains why it's not setup very well - no-one's tried to race it properly for about 20 years!